Have Your Songs Heard By Tom Waits, Brian Wilson, Robert Smith (The Cure), Craig Morgan, Cassandra Wilson, and Many More! September 28, 2006 -- The deadline for ISC is quickly approaching, so enter your songs now! Entries must be postmarked on or before October 16, 2006. One of the largest and most prestigious songwriting competitions in the world, ISC gives away over $150,000 in cash and prizes to 56 winners. The Overall Grand Prize includes $25,000 (US) in cash – the largest cash Grand Prize of any songwriting competition in the world – and $20,000 in prizes. If that’s not enough, ISC also gives away a full scholarship to Berklee College of Music’s Five-Week Summer Performance Program to the First Place winner of the Teen category. ISC is open to both amateur and professional songwriters of every level, and all musicians, artists, and songwriters are invited to submit their original songs. Go to the section "Creativity, Songwriting Competition" for more information. 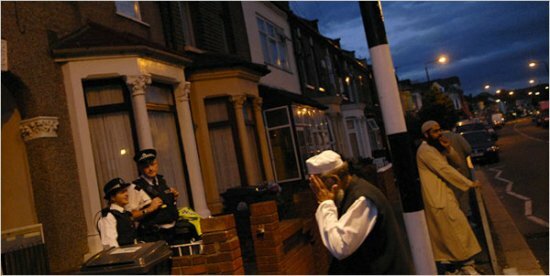 British police officers guarded a house raided earlier in London’s Walthamstow District. LONDON, Aug. 10 — The British authorities said Thursday that they had thwarted an advanced terrorist plot to blow up airplanes flying from Britain to the United States using liquid explosives that would have escaped airport security The officials said they had arrested 24 men, all British-born Muslims, who planned to carry the liquids in drink bottles and combine them into explosive cocktails to commit mass murder aboard as many as 10 flights high over the Atlantic. Intelligence officials said they believed that some plotters were probably still at large, requiring increased airport security. Airports, which faced chaotic delays and cancellations, instantly changed rules on what passengers could carry on board. In the United States, liquids, gels and creams were banned from carry-on luggage. In Britain, all carry-on items were barred except objects like wallets and eyeglasses without their cases. Go to the section "News service, Newsletter of the New York Times, Terrorism", to read the complete article. The Hague, August 2, 2006. The doors of the ‘Paard van Troje’, the place where Heather would do a performance opened at 7:30. P.m. and we went in. The supporting act by SneakerFreak started at 8:30. P.m. until 9:00. P.m. and was disappointing; mostly caused by a bad sound: the bass was too loud and the sound itself was distorted. I think that this was the main reason why it took half an hour before Heather hit the stage, because the crew did a lot of sound checks. 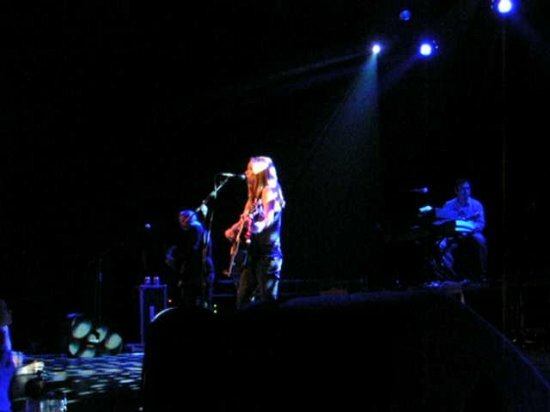 And before Heather enters the stage, one of the crew members took the microphone and requested politely, on behalf of Heather Nova, not to smoke during the concert. He was afraid that lots’ of people would have shouted ‘boo’, but that was not so. In fact, everyone welcomed Heather’s request with an applause. Before Heather started with, I miss the sky, she explained to the audience that she received a letter the other day from a pilot who feels related to her (referring to Emilia Earhart - a female pilot who was lost on June 17, 1937 during a flight over the South Pacific. More information can be found at http://www.ellensplace.net/ae_lflt.html ) and started to play the song. I miss the sky can be found on the Redbird album. Go to the section "Articles, Heather Rocks" to read the whole article and see a short video from Heather on stage. Coming soon: a short video impression of the gig and more than 60 pictures of the gig in The Hage! 83 photos of the gig in The Hague! Go to the section "Articles, Heather Nova Rocks" to see the pictures I've selected for you. If you want to see all pictures in full size, than you must go to the section "Gallery, Heather Rocks"
Pierre Rovasio took on March 18, 2006 some lovely pictures from Heather's performance at Roeselare in France. 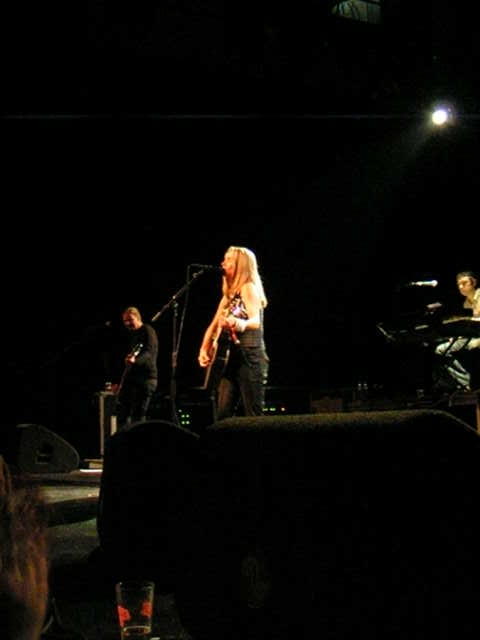 Go to the section "Gallery, Heather Nova in Roeselare, March 18, 2006" to see the beautiful pictures that Pierre took. Thanks again, Pierre for sharing your pictures with us! Many thanks for your kind email. Funnily enough, the Shepherds Bush gig last year was where Heather and I first met – she took some of our Wonderfully Whiffies on the Redbird tour when it went on to Europe. Thank you for putting the link on your page and I will send you some further information about the candles shortly. To be honest, no offense, I didn't know anything about this lovely candle project. If I did know than I would have mentioned it on the Online Magazine, and yes: I am interested in running a review of Heather's candle on the website. Send me all the details and I will publish it on the site and give you all the credits for the article too. Lokerse Feesten - i've met a true angel ! 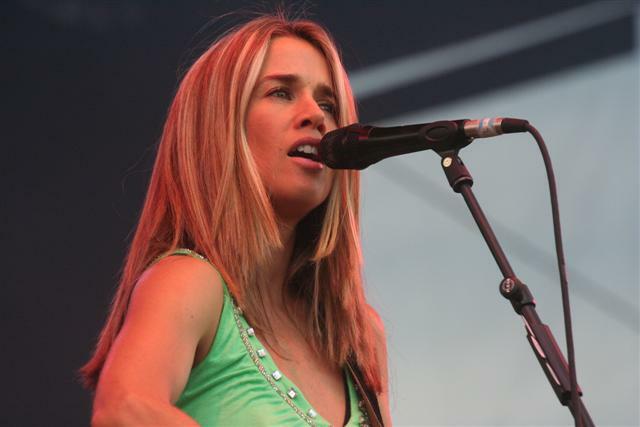 I am glad that you liked Heather Nova! She's simply the best and I am glad to know that you're now a big fan of Heather. Thanks for sharing the hyperlink, I will contact the webmaster if I can use the pictures for our site too. Subject: Lokerse Feesten - i've met a true angel ! You can see some pictures of the concert at www.lokersefeesten.be (see ‘foto’s – zaterdag 5 augustus).